Journey inside an Egyptian pyramid and go hunting for treasure in Legacy of Ra MegaWays. This 6 reel video slot has been created by Blueprint Gaming and uses the MegaWays game engine which varies the potential ways to win with each spin. There’s also a bonus round that offers unlimited free spins with special expanding symbols. Play this volatile game on all devices from between 10p and £10 per spin. The design in Legacy of Ra MegaWays is rather nicely done. The setting is the ornately designed interior of a pyramid. Joining the A to 9 royal values are a scarab beetle, an assortment of burial masks and the Egyptian god Ra. The best standard symbol is the Lara Croft-style treasure hunter. She awards 0.5, 1, 5, 10 or 25 times your stake if you land 2, 3, 4, 5 or 6 on adjacent reels. There’s also a wild that substitutes for everything apart from the scatter (the Legacy of Ra logo). The Free Spins feature is triggered by landing 3 or more of that logo scatter anywhere on the reels on the same spin. Hit 3, 4, 5 or 6 and your reward will be 10, 15, 25 or 50 free spins. Before the feature begins, 1 symbol is chosen at random. Whenever this symbol lands during the feature, it expands to fill the whole of the reel. If this is a higher value symbol, then the coins can quickly start to flow. You can also win more free spins – indefinitely. If you wish you can also buy your ways into the Free Spins feature via the Ra Bonus Bet feature – this will set you back 100 times your total bet. Legacy of Ra MegaWays is pretty straightforward for a MegaWays game. It’s a volatile game too with potential wins of 50,000 times your bet on every spin/free spin. There’ll be spells which seem as barren as a Sahara desert. If the game engine expands to its maximum 15,625 MegaWays, you can expect plenty of action. Likewise, if you manage to land one of the bigger allocations of free spins and combine it with a lucrative expanding symbol. We liked this latest addition to the MegaWays catalogue. It looks and sounds good and delivers some potentially explosive action. It also combines the classic bonus feature from Novomatic’s Book of Ra Deluxe which has been copied by many providers. 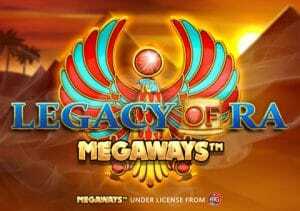 If you’ve enjoyed other video slots in the MegaWays series then Legacy of Ra MegaWays is certainly worth a closer look.